Product review: Rich – by As Above, 17 Oct 15 4/5 Good "Had no difficulties arranging and subsequently re-arranging my date. Easy to find, well signposted from A1, all facilities were clean and available. Staff are all pleasant, instructor/pilot was helpful, calm, friendly and accommodating. To a novice, the equipment seemed up to scratch. The briefing was good, I felt in safe hands and the instructor/pilot answered all my questions well. I enjoyed the trip especially as I passed over and identified several areas I know well. The trip was made better by the ability to accommodate my 9 year old son on the flight at short notice! He loved it! I doubt that I would put myself out to do it again but if you are offering!! I would recommend it or buy it as a gift for someone else though. There was plenty of time before and after the event for photographs and time to linger if you feel inclined. " Experience the thrill of flying an aeroplane yourself. 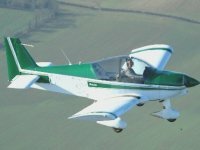 After a safety briefing and under the guidance of a professionally qualified CAA flying instructor you will be given a thorough introduction to the basic flying manoeuvres and will actually take the controls for the majority of the flight. At the end of the flight you will be given a commemorative certificate. The School was crowned "Flying School of the Year" 2005/6 by Flyer Magazine - a friendly welcome is guaranteed. This activity is not recommended for those suffering from diabetes or epilepsy or for pregnant women. Maximum weight is 16 stone, maximum height 6'5". Wear comfortable seasonal clothing and flat shoes. All specialist equipment will be provided. In the event of postponement due to weather or to mechanical issues, the flight will be rebooked until completed. Please note that vouchers are non-refundable under any circumstances. Had no difficulties arranging and subsequently re-arranging my date. Easy to find, well signposted from A1, all facilities were clean and available. Staff are all pleasant, instructor/pilot was helpful, calm, friendly and accommodating. To a novice, the equipment seemed up to scratch. The briefing was good, I felt in safe hands and the instructor/pilot answered all my questions well. I enjoyed the trip especially as I passed over and identified several areas I know well. The trip was made better by the ability to accommodate my 9 year old son on the flight at short notice! He loved it! I doubt that I would put myself out to do it again but if you are offering!! I would recommend it or buy it as a gift for someone else though. There was plenty of time before and after the event for photographs and time to linger if you feel inclined.